Santa Claus is taking center stage for this Christmas nail design! I did a Santa and Rudolph Nail Art last year. For 2011, they made solo appearances on my nails. Check out Rudolph in my Reindeer Nail Art, where I featured him on my left thumb and gave him a girl friend! This time, Santa Claus takes over. If you have been following this nail art blog for awhile, you might have noticed how fond I am of painting a design on all my nails. But I have been receiving emails asking me if some of my designs would work if only painted on one nail. I would always answer with a yes. 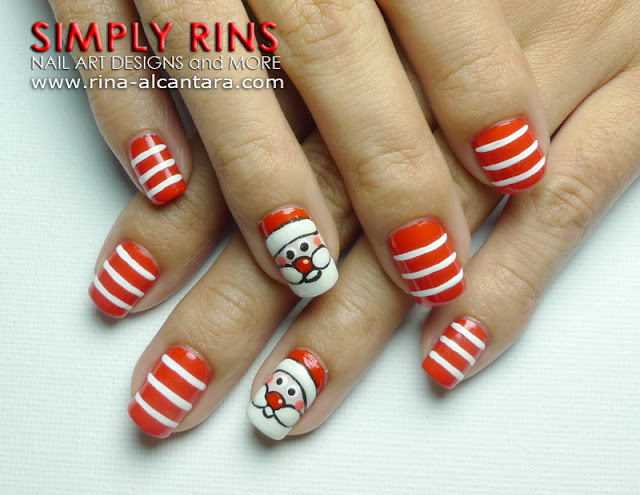 This Santa Claus nail art is an example. I understand that there are instances wherein you don't want your nails to attract that much attention. An accent nail is a good solution. I wanted a wear a basic red for this design and as I look into my stash, I was lucky to find OPI Tazmanian Devil Made Me Do It. I wore this in 2 coats on my nails, except for the accent nail where I used 2 coats of Orly Pure Porcelain as skin tone base for Santa. Everything else was painted using acrylic paints and a detailing nail art brush. I was supposed to leave the other nails plain but I wanted to subdue the basic red polish. So I decided to add 3 white stripes on each nail using a striping nail art brush. The stripes was subtle enough not to overpower the Santa Claus accent nail and enough to tone down the bright red polish. Polka dots is another option for the other nails. I would suggest small dots that are relatively far apart so that Santa Claus would still remain the highlight of your nails. Santa is so cute! He looks so Jolly and his rough is darling! Absolutely adorable! I really like the accent nail, and your stripes are so evenly spaced on the rest of your nails, I'm jealous, I can never get my spacing to look that good. Oh, Santa is so pretty!! I'll try it soon:)! I love your nail arts<3 You're ma inspiration for a long long time. you always make all of your characters look so adorable! <3 santa's so adorable with blushing cheeks pa! Hi! It's the first time I see your designs and I tried this one at once. Totally love it! Your tutorial was easy to follow, thank you very much! Sorry if my english isn't perfect. I'm from Sweden and my english isn't the best. Hi iam from greece!!! i try to make my nails like yours!!! i want to see more cute nail designs!! You are fantastic!!!!!!!!!!!! This is to let you know that I read all your comments and I'm really appreciate the effort of leaving a message here. i can't say enough how good u r!! Thank you for sharing this little tutorial. Now I can make a new nail art design on my own. I just wish that I can do it perfectly.